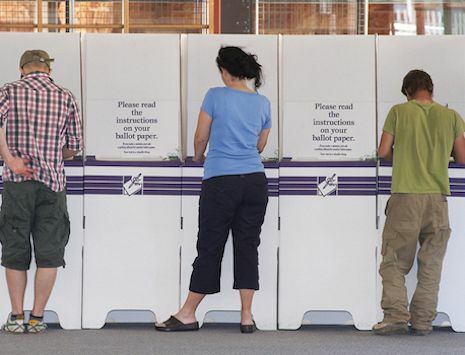 As the Turnbull Government pushes for "reform" in the Senate voting system, Dr Geoff Davies discusses "approval voting" as a truly representative alternative. THE COALITION has been negotiating with The Greens to change the Senate voting system. Proposed changes reportedly would exclude most minor parties and some of the Greens, while benefiting mainly the Liberal Party. It is claimed the Senate voting system results in an unrepresentative Senate, because the system has been gamed by minor parties to gather preferences and get one of them elected. There is some truth to the charge in that quirks can determine which minor party is elected. On the other hand, no minor party would be elected if the major parties were not so unpopular. However, the more fundamental problem is that no conventional preferential voting system can reliably reflect the voters’ will. Strangely enough, there is another voting system that would reliably reflect the voters’ will and it is a widely used system. It's just not used in elections. Would The Greens party please pay attention? Australia was a pioneer of preferential voting and we tend to sneer at the Poms and Yanks for using the primitive first-past-the-post voting system. Don't they realise a candidate can be elected by perhaps only 30 per cent of the voters if there are several candidates in the field? The other 70 per cent of voters did not want them. In the U.S., a third presidential candidate has sometimes "distorted" the result by taking votes from the candidate who otherwise would have gained a majority. In some European systems, if no-one gets more than 50 per cent, then the top two candidates go into a second-round "run-off" election so everyone gets to express a preference between the two main candidates. A preferential voting system accomplishes this in one go, because you can vote for a third candidate and still express a preference between the other two. Americans call preferential voting "instant run-off". The trouble is our preferential voting systems can still produce quirky results. We've seen this in some recent Senate elections, in which the last candidate elected got only about one per cent of the primary vote. A more serious anomaly occurred recently in Western Australia, in which the fall of a handful of minor-party preferences at a key stage of the counting ended up determining which major-party Senate candidate was elected. As much as you'd like to complain about the Canadian voting system...at least it's not like Australia's. Enjoy! Arguments about voting systems have been going on probably ever since voting was invented. There is even a clever mathematical theorem by the economist Kenneth Arrow that says no preferential “ordinal” voting system, in which voters rank the candidates in the order of their preference, can be guaranteed to closely reflect the will of the people. Enter a rather obscure and technical 2005 academic paper by one Claude Hillinger of the Ludwig-Maximilians University in Munich. He points out that, in fact, we commonly use a different way of measuring people's wishes and it cannot be gamed and does not produce quirky results. The other system, which he calls utilitarian voting but I prefer to call approval voting, is commonly used to determine the level of voters’ approval of the performance of prime ministers and other politicians and sometimes to choose among different policies. It is also used commercially to measure the popularity of products. This is the kind of survey in which you might be asked about each alternative, whether you approve, disapprove or don't care. The surveyor assigns a score to each option, such as plus one, minus one and zero and simply adds up the scores for each alternative. Sometimes the scale is extended to include strongly approve (plus two) and strongly disapprove (minus two). So in an election, a ballot paper would list all the candidates and you could assign your score or degree of approval to any or all candidates. The candidate with the highest tally of scores would be the winner. If there were, say, five candidates to be elected then the five highest scorers would be elected. This system has many advantages. It is simple. It does not distort the will of the people. The underlying reason is that the way your assessment contributes to the final tally does not depend on anyone else's assessment. Your assigned scores are simply added directly into the final tallies. With preferential voting, in contrast, the way everyone else votes can determine which preference in your list ends up being used at the end of counting. There would be little opportunity to game the system, as minor parties have been doing in recent Senate elections, because there are no preferences that can be manipulated — simply a tally of scores. There would be no such thing as an informal vote, because if you did not rate a candidate it would be taken to mean "don't care". It gives you many options in assigning scores. If you were equally comfortable with two candidates, you could give them both your full approval, and they would both benefit. If you had no preference among all the candidates you could give them all the same score or just leave your ballot paper blank. If you wanted to maximise the chances of one candidate, you could give them maximum approval and all the others maximum disapproval. You could do the reverse if you wanted to minimise the chances of Tony Ab … er, I mean of a candidate of which you really disapproved. It would yield an overall assessment of the winner. This is an important benefit that Hillinger did not mention. If all parties were very unpopular, as has been true in Australia for some time, then that would show up in the scores. For example, a winning candidate might get an average score of only minus one and the other candidates minus one point five or lower. In that case, it would be clear that voters had chosen the least undesirable candidate, rather than one of whom they really approve. Winning politicians love to claim they have a mandate for all their policies. It's never that simple, of course, but with this system you would at least have objective evidence that they had not been “approved”, just tolerated as the least-worst alternative. So let’s have ballot papers that survey our approval of candidates, elections that simply and straight-forwardly choose the most-approved, or least-disapproved, candidates and results that register our collective degree of approval or disapproval. Dr Geoff Davies is an author, commentator and scientist. He blogs at BetterNature (betternature.wordpress.com). He is also the author of Sack the Economists (Nov 2013, sacktheeconomists.com).